Aimee Barnes has worked for more than a decade on climate change and environmental sustainability issues in the public, private, and non-profit sectors. 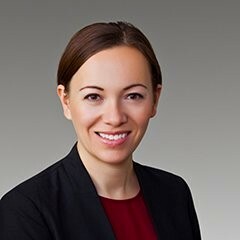 She currently serves as Senior Advisor to California Governor Edmund G. Brown Jr., following an appointment to the California Environmental Protection Agency (CalEPA), where she served as Deputy Secretary for border and intergovernmental relations. Barnes successes since joining the Administration include helping to launch the U.S. Climate Alliance, a bipartisan group of 17 states committed to reducing greenhouse gas emissions in line with the Paris Agreement, and leading the state’s planning efforts for the 2018 Global Climate Action Summit. Barnes’ work with CalEPA included the negotiation and execution of climate change and clean energy agreements with China, Mexico, and others; participation in the Paris climate talks; and development and execution of a subnational-level climate agreement among 130 state- and regional-level jurisdictions on long-term decarbonization goals. Before joining the Governor’s Office, Barnes was a partner at Allotrope Partners, an investment firm specializing in early-stage companies in the carbon and clean energy sectors. Earlier in her career, she served as an international climate change policy advisor for the United Arab Emirates (UAE) Ministry of Foreign Affairs, where she helped establish a new department to manage the country’s climate and clean energy policies. She supported the country’s engagement in the United Nations Framework Convention on Climate Change and Rio+20 negotiations, including advocating for the adoption of the Sustainable Development Goals. She also worked on the UAE’s hosting of CEM2 in Abu Dhabi in 2011, including the country’s C3E engagement. Previous positions include policy advisor for the United Kingdom Department of Energy and Climate Change’s Strategy Directorate, senior manager of U.S. regulatory affairs at EcoSecurities, and California and Latino advocacy outreach coordinator and senior land attorney assistant at the Natural Resources Defense Council. Barnes holds an MPA in Environmental Science and Policy from Columbia University’s School of International and Public Affairs (SIPA) and a degree in Environmental Studies from Dartmouth College.